Hit the trails today with an ATV/RZR rental from AZ Power Toys! We provide the latest models to explore the Phoenix desert terrain. Great for a leisure family outing or experience a bit of adventure. Ride a RZR Now! 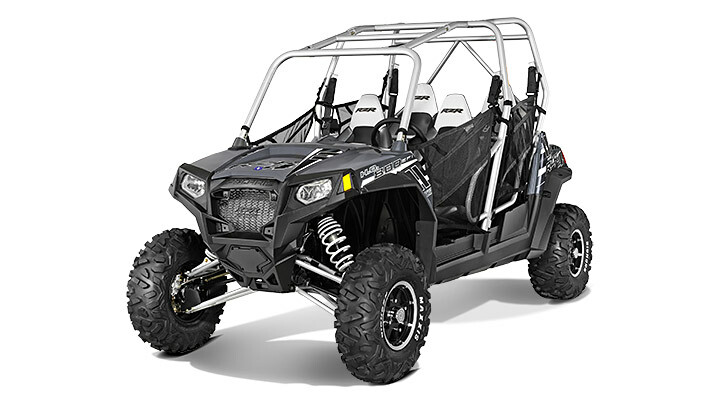 The RZR 4 800 has been strategically designed to enable the lowest center of gravity possible, with the engine and other components integrated using Polaris’s exclusive Centralized Mass Design (CMD), enabling sharp turns with stability. When you get stuck somewhere, you can ask your friends to help push you out, or you can all stay buckled in and kick in the On-Demand True All-Wheel drive to get going again. For when the going does get rough, your passengers also have an adjustable grab bar. A four-stroke twin cylinder 875cc engine is cooled by a durable dual clutch inlet, which draws in air to cool at high and low speeds, while an automatic transmission provides two forward speeds, one reverse, and a parking gear, making operation simple enough for any driver. Four hydraulic disc brakes with dual-bore front calipers ensure you can always stop— while a 7.25 gallon fuel tank keeps you going for hours of fun.